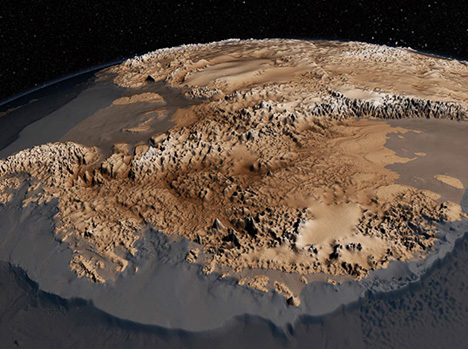 Antarctica is the most mysterious continent on the planet. The 5,400,000-square mile land mass is completely covered with ice, and no human has ever seen it without its frigid shroud. 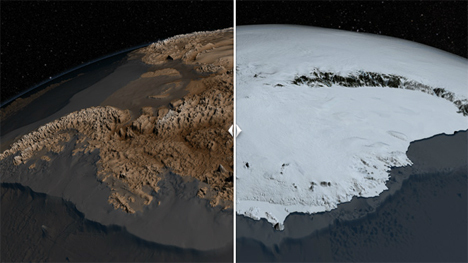 After decades of research, NASA, with the assistance of the British Antarctic Survey and images from the Ice, Cloud and Land Elevation Satellite (ICESat), has developed the most comprehensive topographic survey of the continent, sans ice. To compile the proper data for the project, NASA looked at surface elevation, ice thickness and bedrock topography in order to best understand the region’s peaks and valleys. 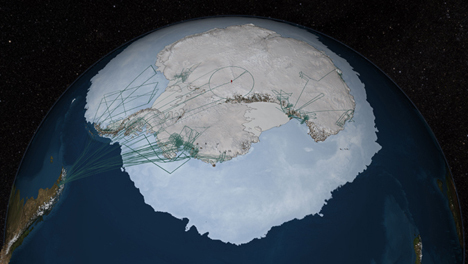 Another collaborator, an airborne data-collecting project called Operation IceBridge, gave the final image more detail. Data from the collaborators was collected for a decade, allowing researchers to analyze the intricate nuances of the continent. According to the project’s website, “Antarctica plays a large role in the global climate system.” Aside from being an interesting project – showing humans something amazing for the first time – the survey gives researchers a better comprehension of ice melt. And having more details about the buried bedrock is crucial, as it gives them a better understanding of climate change. This better understanding comes from being able to predict how the melting Antarctic ice could change ocean levels. Digging in under the ice, so to speak, gives scientists a more thorough understanding of how the ice will move based on buried land features like mountains, slopes, and bumpy terrain.